You know how I've been saying that there are natural alternatives to yucky preservatives like parabens and ureas—chemical ingredients that have been linked with skin irritation, dermatitis, and other potentially more serious health effects? Well here's one of them: aspen bark extract. A natural preservative, this ingredient also has skin conditioning properties. No surprise, as when you're dealing with natural ingredients, they often impart more than one benefit to your formula. So much smarter than using potentially harmful chemicals, don't you think? 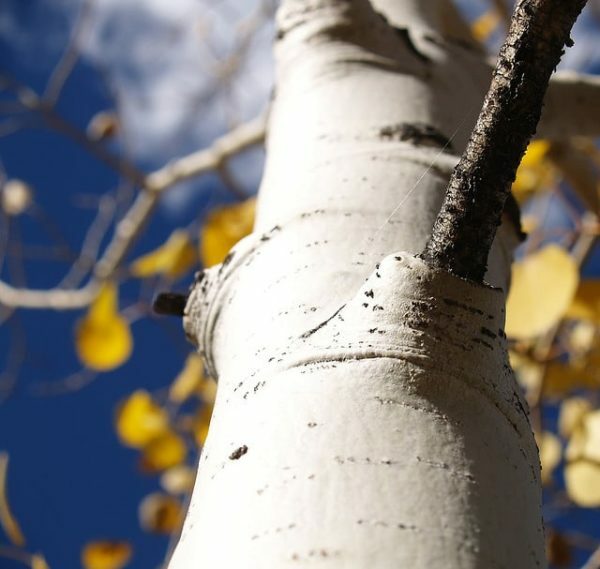 What makes the Aspen tree resistant to disease also helps protect your skin care formula from contamination. Aspen is actually the name of an entire tree species, which includes several varieties like the American aspen, Eurasian aspen, Japanese aspen, and Chinese aspen. The Quaking aspen, which grows widely in North America, is also called the trembling aspen, golden aspen, and mountain aspen. All these trees like cold regions with cool summers, and typically grow at high altitudes in the mountains. They do like the sun, and reach from 49­–98 feet tall. What's unique about these trees is that they're considered to be the stems of one of the earth's largest living organisms. Hundreds or even thousands of trees—which are actually clones of one another—are all joined underground by a single root network. Because of this built-in support system, they can live for thousands of years. Even if the trees die, the roots can stay alive underground for many years after. This shared root system also means that all the tree leaves turn color at the same time in the fall, creating a large brilliant display. The American Indians are known to have used the bark of the aspen tree to brew a tea that would treat numerous ailments. Because the bark is rich in a substance called “salicin,” which is similar to the active ingredient in aspirin, it was used to provide pain relief and reduce fever. Aspen is also considered a digestive tonic—soothing to the tummy. It was used to treat diarrhea as well as bladder inflammation or urinary tract infections. Aspen wood was also popular historically for making bowls and paddles, and today it's still used to make chopsticks and playground equipment, since it is lightweight and doesn’t splinter. Shredded aspen is also used for packing and stuffing, and makes popular animal bedding. The main use of aspen bark extract in skin care is as a natural preservative. An excellent alternative to parabens, it protects your product from contamination. This helps to extend the shelf life of natural skin care products so you can use them until they're gone. But aspen's benefits don't end there. Because of it's natural salicin content, it gives you a soothing feeling. The extract also has a conditioning property, helping to make skin smooth and soft to the touch. Finally, the ingredient has a very low irritation potential, meaning that even those with sensitive skin can use it without worry. That's certainly something you can't say about chemical preservatives! I can't answer that question, but I can refer you to my products, several of which are protected by aspen's preservative qualities. Did you know that aspen bark extract makes a great natural preservative? Please share your thoughts. Photo courtesy Aidan M. Grey via Flickr.com. That is so cool! Natural, beneficial, does the job, AND sustainable!! Very cool of you guys not only to use this ingredient, but also to inform others about it and call out other companies for using harmful preservatives when it’s completely unnecessary! How can aspen bark be extracted without harm to the tree? What is the best way to harvest Trembling Aspen bark? I would like to try using it as an anti-inflammatory for my arthritis but am not sure which parts of the tree to use or how to use them. When you harvest from trees you want to be careful not to hurt it so typically you would take from the smaller branches and peel or chop the bark. I’ve never worked with Aspen bark directly, so I would suggest doing a bit of research on the best way to harvest sustainably for that specific tree. We’re honestly not sure. We use it in our skin care because we know it to be safe and effective as a topical healer and preservative but we that doesn’t necessarily mean that it’s ideal for a food preservative. There are probably better (and tastier) options for preservation, we would suggest chatting with a raw food company to see how they do it! I also make my own organic products. I use potassium sorbate, which is perfectly safe and very effective against moulds and fungi, but it’s not as effective against bacteria, so I really want to try this apsen extract. I’ve been researching a lot about it, and it seeems there are a few opposing opinions about it’s effectiveness. –> There is this one: “it inhibits the growth of mold, yeast, e-coli, Saureas, subtilis, and other microscopic bugs. This helps to extend the shelf life of natural skin care products so you can use them until they’re gone without fear of contamination”. –> And then there’s this one: “Right now radish root extract and aspen bark extract are touted as all-natural anti-microbials. These extracts alone cannot work as preservatives of regular moisturizers, meaning the facial creams that contain water. In fact, no “natural” extract can. Look at fruits, vegetable, roots and herbs. They all contain water and once cut, the bacteria and other gems, get hold of them very quickly. My Aspen Bark comes from NDA (New Directions Aromatics). They are extremely inexpensive, but now they just started a minimum $100 purchase policy. Either way, I get 99% of my supplies from them because of their quality and their prices can NOT be beat! I also believe you can get it through ‘Natural Beauty Workshop’ and possibly ‘Mountain Rose Herbs’. Just do a search for ‘Where to buy Aspen Bark Extract’, its that simple. Where can Aspen bark be purchased? Yes Aspen Bark can be purchased by anyone online. It is considered an “active” and can be found at several websites that sell active ingredients for skin care formulations to anyone interested in doing it yourself (DIY). One such site is Lotioncrafter. If you are making, let’s say lotion, at what point would you add the aspen bark? Thanks!